IT Carlow a developing third level institute has been investing heavily in the campus for the last few years to make it the number one technology College in the South Leinster area. 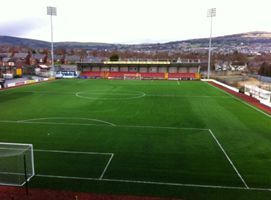 One area of priority for funding was the provision of an all weather 3G pitch to enhance pitch sports facility provision at the IT. Hosting an FAI approved course, it is important that the College provided the facilities to enable coaching and player development to occur even in the winter months. Therefore in 2010 a tender was issued for the construction of a new full size FIFA 1 star football turf pitch. 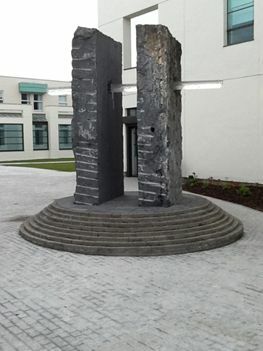 Crawford Contractors out of Wexford were awarded the contract and work started in February of 2010. The football turf, a Lano Profoot MXSi 60 - our top of the range two-tone monofilament carpet has been installed in a number of sites such as the prestigious Man Utd's training ground at Carrington and Clifftonville FC in Belfast where it has achieved FIFA 2 star certification so has an impressive pedigree. 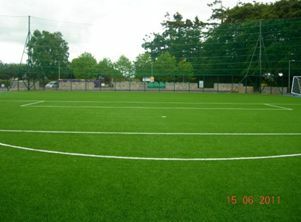 The performance of the playing surface was very important to the users being an area which is dominated by the need to develop soccer and is used for training goal keepers as well as facilitating Gaelic games skills development. In addition to the high performance turf the College had the foresight to elect to have a shock pad installed to promote long term performance and safety. 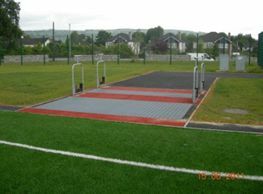 The facility has some unique features; as mentioned previously an integrated goal keeping area, 15m ball stop fencing to protect the adjacent highway and recycling centre which is very close proximity to the pitch, Sports Labs mandatory ‘detox area’ for cleaning footwear prior to accessing the pitch. As with most pitch projects the weather interrupted ‘play’! Whilst very frustrating for the Client ultimately there can be no compromise on quality so even though extreme patience to finish off the pitch in adverse weather, the end result is a high quality facility which will perform for years to come. Pat Murphy, Project Co-ordinator, speaking on behalf of the Institute, are delighted with the turn-key service provide by Sports Labs from drawing up the specification, planning, public tendering through to sign-off. The I. T. Soccer coaching staff are ‘chuffed’ with the finished surface, which makes it easier to deliver the skills development aspect of the IT programme. The completed facility considerably enhances the existing sports facilities on-campus, and has generated considerable interest in the use of the pitch from sports clubs in the surrounding locality, when it is not in use by the Institute. 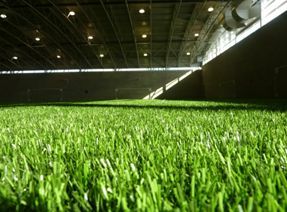 Crawford’s have been engaged to maintain the facility in the short - term to ensure that the playing surface is kept in tip top condition, this is another aspect that Sports Labs introduced in the procurement process to protect the surface by carrying out the recommended maintenance by the Company who installed the pitch to provide the client with an extended warranty.